Basketball fans will have to wait a few more months for the 2014 NBA season to begin, but many of the league’s top players will be in Spain for two weeks in September to play in the FIBA Basketball World Cup. This tourney is held every four years and the heavy favourite (USA) come in as the defending champs. At 1.50 the USA is the heavy favourite to defend their title from 2010 when they beat Turkey in the championship by 17 points (81-64). USA won every game in the elimination round by double digits and given how loaded their team always is, they should have some easy victories again this year. However, the talent on this year’s Team USA isn’t as good as it has been in years past with no LeBron or Durant in the mix (arguably the best two players in the world) and they could have a tougher time with some of the better countries. Durant led the way for the US back in 2010 and without his scoring ability out there, the States will have to rely on guys like Stephen Curry, James Harden, Kyrie Irving and Anthony Davis to dominate at their respective positions. Don’t get me wrong, the 2014 US team is still loaded with top-level NBA talent, but at 1.50 to win it all I believe they aren’t worth the price here. The team behind the US in the odds is the host nation Spain at 2.50. The Spaniards have plenty of NBA talent on their roster too and after getting upset by Serbia in the quarter-finals back in 2010, this prideful country will be looking to dominate on home soil. Spain is still led by the Gasol brothers in the middle and with their ball movement, European style they’ll be an entertaining team to watch. OKC’s Serge Ibaka will be counted on to produce, along with NBA and Euroleague players Jose Calderon, Victor Claver, Ricky Rubio and Rudy Fernandez. Home court is always a plus, but the host nation hasn’t won this tournament since the former country Yugoslavia won back in 1970. In fact, only one host nation has even made the Final since then at that was Turkey last time this tournament was played. Spain is looking to be one win better this time and as a small underdog to win it all with top tier NBA talent as well they deserve a hard, long look from futures bettors. Speaking of the Turks, they are 101.00 to win it all this year and with a heavily reliance on NBA players Enes Kanter and Omer Asik, I just don’t see them having the depth to make another deep run this year. Behind the USA and Spain is Argentina 31.00, Brazil 36.00, Greece 36.00 and France 36.00. 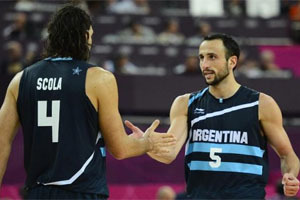 Argentina has had past success in this tournament including an OT loss in the Finals in 2002 and losing in the Bronze Medal game to the States in 2006. They were led by a much younger Manu Ginobili in those years and won’t have the aging veteran suiting up for them again this year. Instead, they’ll be lead by Pablo Prigioni and Luis Scola as their only two NBA players that see significant minutes in the league and I’m not sure those guys will be able to lead there team on another deep run. Of the rest of the teams in that group, Brazil and France are the deepest in terms of NBA talent and both have a legitimate chance at this title. Neither team performed well in 2010 with both being eliminated in the Round of 16 (first elimination game) and knowing that nobody else in this tournament is ‘completely’ stacked both countries have to like their chances. If you were to force me to chose one of the two that had the best chance I’d have to side with the French as I believe they’ve got a bit more depth and talent in their line-up and could pull off an upset or two to win it all. However, from my seat this tournament is going to come down to a showdown between the two favourites USA and Spain in the final with my money going on the underdog Spaniards. All the stories you find about this Spanish team are about how motivated they are to win this championship on home soil. With USA’s perspective on this tournament being more of an ‘afterthought’, especially after the gruesome Paul George injury in training camp, take Spain to win at 2.50. Make sure to take advantage of a free bet up to $25 when you place your first sports wager via the Carbon Sports mobile product at m.carbonsports.ag.